Homegirl is up to 19 pounds! Go big girl whatchu gon' do?! Not sure..we haven't gone to her 6 month check up yet! The only reason I know her weight is because we did make a trip to the doctor a few days ago, but they didn't measure her height! 6-9 months in most everything except her sleepers. It varies by different brands but we buy all of her pi's from The Children's Place and we just moved her into the 9-12 month size! Everything else, clothes wise, she is in 6-9 months! Size 3, but getting a little snug around her thighs. I'm also still hating Huggies and loving Pampers Cruisers! Oh boy, I've created a diva in the eating department! When we started solids I was just giving her Gerber or Beechnut. Then I got all wannabe-hippie and got the Baby Bullet and started making her baby food. Now when I try to give her Gerber/Beechnut? She purses her lips together and turns her head. Oh no she di-int. Oh yes she did. On one hand it makes me feel like I've hit the Mommy Jackpot and on the other hand it makes me wonder what the H#! @ I've done to create a picky little monster! She literally leaps for the spoon when I feed her my food! She's not too keen on the fruit though. She really likes her veggies and now I'm wondering where this child actually came from. This comes from the girl who lives off fast food and could eat McDonald's 24 times a day and was positive that I was going to birth a 7 pound cheeseburger baby. She is still taking formula every few hours, but I can tell that she's becoming less interested in it. She finally has a significant amount of hair. I'm taking full credit for how much it's grown because I massage her scalp every night during bath time! 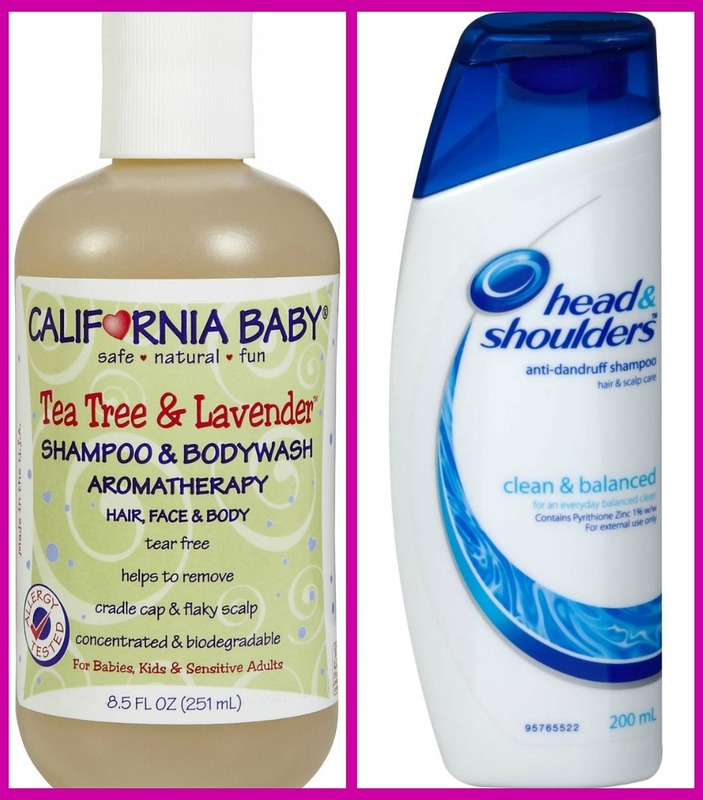 We've also found a good remedy to keep her cradle cap away. 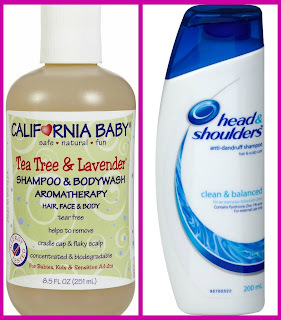 I wash her hair with California Baby Shampoo, use a fine tooth comb to scrape any of the cradle cap off, then I wash her hair again with a little bit of Head & Shoulders. Then then THEN when she gets out I put Aquaphor on her head. She's then a nice little grease ball. Goes to bed around 7:30 PM and sleeps until about 7:00 AM. She takes a short morning nap around 9:30, then a longer nap around 12:00! Sometimes she will take a short afternoon nap when we get home but not all the time! Definitely totally for sure Mickey Mouse Clubhouse. I bought The Little Mermaid DVD just hoping that she'd love it too, but nope. Doesn't care. I end up watching the movie all alone because she gets bored that there's not an annoying mouse yelling "HOT DOG!!!!" Ahhhhhh! She has this one rattle that she loves. She usually bangs her head with it but I usually don't stop her. I figure that just a few more times of beating herself up she'll learn to stop! She only got ONE BILLION toys for Christmas, she loves all of them. Especially the ones that require batteries and sing really annoying songs. THAT'S ALL OF THE FREAKIN' TOYS!!!!!!!!!!!!!!! She is officially a sitter-upper and that makes me happy! I don't want her to ever ever EVER learn how to crawl or walk because then my life is over with,FOREVER! She can almost hold her bottle by herself! I think she could probably do it all the time right now but she's just lazy. Gee. Wonder where she got that from. I'm about six hundred and eleventy percent sure she has a tooth that's about to break through. Or at least it better, because homefry chews on her hands like it's her job. She also drools like there ain't no tomorrow. Which is super annoying because her bibs cover up her cute clothes. 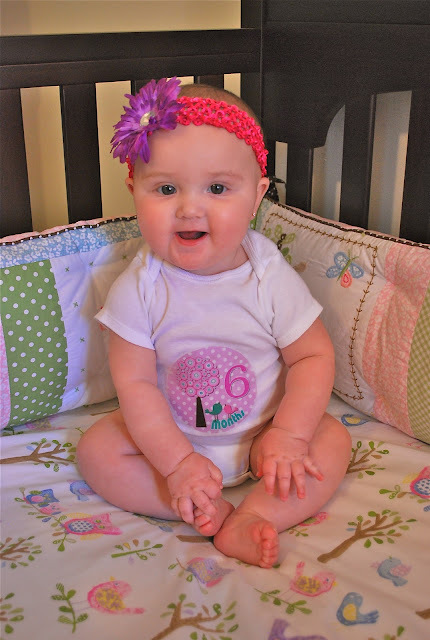 I can-freakin-not believe that our little PDizzle is 6 months already. I'm not gonna lie though, the first few months of her little life were kinda.....boring. She just sat there in her swing or bouncy seat..staring at things. Now that she is showing her personality more and able to sit and play it's way more fun. I miss her being tiny and stuff, but I'm also glad that she's growing up. She's got the sweetest face and the funniest personality. I can't wait to see what she will be like in a few more months! Awww, she is so cute!! I love how she looks right at the camera for you! Guinevere is all, "you've got a camera? muahhahaha" and then goes out of her way to make bizarre faces and purposely fall over. How are we already at over half a year?! Better yet...how are we at less than half a year to start planning the first birthday party? !